Thank you for taking a look at the Tampa Airport Park Sleep Fly section. Previously, you'd have to deal with a number of different companies individually when taking a flight, racking up multiple charges on your statement. Now you can merge all your preflight needs into one transaction. Using this service you get a hotel stay, a shuttle to the TPA Airport and your car will be safe at the hotel for the duration of your trip. You'll have plenty of time to get your ticket, go through security and make your flight without being exhausted. Park Sleep Fly packages make air travel convenient! Tampa International Airport parking is stressful, expensive, and unreliable. Take the edge off this part of traveling, and book a guaranteed parking spot with us. At an affordable price, you get a safe parking spot from one of our parking lot partners. You even get a shuttle service to help you transport your luggage and get you to the check-in counter as soon as possible. You have nothing to lose. Instead, you have a ton of peace of mind to gain. With AirportParkingReservations.com you no longer worry about the logistics of parking! 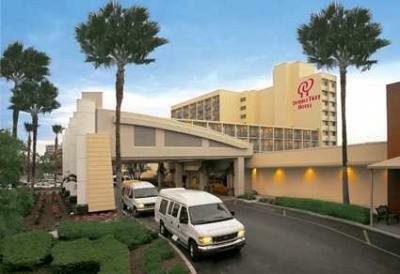 Tampa International Airport is located on the shores of Tampa Bay near I-275. It is 6 miles west of downtown Tampa and 21 miles northeast of Saint Petersburg. There are thousands of parking spots in garages, and arriving passengers may rent cars at counters next to the baggage claim area. Tampa's local bus system also serves the airport. Many airlines serve Tampa International Airport, and there are flights to destinations across North America, Latin America, and Europe. It is the 29th busiest airport in the US. The airport is spread out in a unique fashion that is easy to navigate. Passengers check into flights and claim baggage in the central terminal. An automated people mover systems connects this area to four separate satellite terminals. Each facility has its own security checkpoint, so passengers should make sure that they end up in the right terminal.